Gosh, I didn’t realise that it’s been so long since I updated this page on my website. I have managed to get out to a few clinics with Ligero and he has been working well. He has just had his 18th birthday and is looking and feeling great for his age. My teaching is keeping me busy and my clients have told me I must keep them up to date more on Facebook, so Please check out my Facebook page for news and clinic dates. Thank you. It was a slow start to the new year with the constant wet weather, and I think most of us were finding it hard to get motivated, it seemed to go on forever. As I write this the sun is out and it now seems a long time ago. I did manage to have a super clinic with Ligero in March with Alex Cookson. It was lovely to get out and about, Ligero felt better than ever. He is now 17yrs old & he still keeps surprising me. He was a very distressed 10 year old when I took him on, and it has been a very interesting and rewarding journey. Over the years that I’ve owned him I’ve had people make comments about me not having a warm blood type and competing more. I didn’t go out to get a Spanish horse, I was just helping with his rehabilitation and ended up bringing him home. He has been difficult, but, only because he was so nervous and demanded more patience than I ever knew I had. He is a pleasure to own and train and has a lot of talent, however, progress has been slow at times due to his confidence issues and this also affects competing. He finds it hard to relax in a new environment. When it comes to competing, temperament is top of my list of requirements, and unfortunately, Ligero doesn’t have the ideal temperament for a competitive career. The training and what my horse needs means more to me than competing. If Ligero was more relaxed about it, I would do more. I did venture out to compete in May, and having not been out competing since last September, Ligero was very tense. He still managed to be 2nd on 67.41% which was a nice surprise, as he had given me a difficult ride that day. 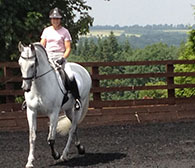 We then had a good time together on another training clinic with Alex in early June. Having those ‘eyes on the ground’, watching and discussing training with friends is so important and fun. We followed this clinic with another competition & Ligero won the elementary on 66.38%. 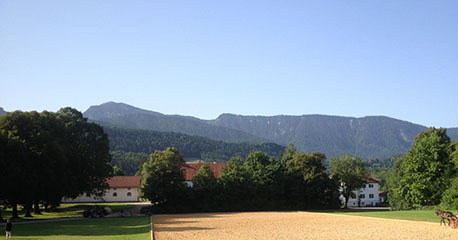 A quiet month followed as the summer weather became too hot for lessons unless they were very early or late in the day. The long dry spell was awful for the school and it began to feel too heavy to ride in. 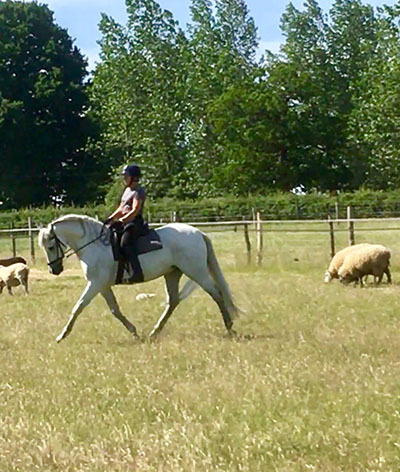 My paddocks had a lot of grass coverage and felt quite springy under foot, so I schooled Ligero in the fields with the sheep and he seemed to love it and really relaxed in his work. It was so hot at Hickstead on the first few days we were melting. I taught on the simulator with another instructor in the BHS tent on the Wednesday. I was so glad that there were 2 of us to share the teaching as it gave us time to cool down between sessions. 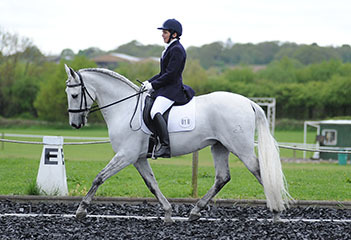 As I don’t update my website often, it’s worth taking a look on my Facebook page for info on clinic dates and items of interest : Debbie Moore Dressage Trainer. I’m still doing my Aloe Vera business and welcome any questions you have about it. I use many of the products daily on myself, dog and horses. The company is celebrating 40 years this year. They have always had a 60 day money back guarantee on all of their products and they have not been tested on animals. I think that says a lot about them. Please email or call me if you would like to know more. It’s been a busy year, I finally completed my acupressure case studies and passed all my exams. My clinics have been well attended and Ligero has been working well and feeling good. In October I travelled to Dovecote in Oxford with some clients to watch Manolo training for 3 days. It was another inspiring clinic and we all had a super time again. Highly recommend you see him if you get the chance. A very special man. I’ve also been enjoying my Aloe Vera business and seeing the benefit it can have for some people and their animals. The feedback has been positive and encouraging. I’m not a sales person so most people have been contacting me on recommendation, which is really nice. In November came the very sad news that the TTT after 30 years is closing at the end of December this year. The news made me feel like a best friend had died. The membership is devastated as this has been a unique place for training and given us access to trainers we would not have been able to train with easily anywhere else. It’s the only place that I know of where you would see continuity of riders and their horses over the years, and watch them develop their riding and train their horses through the levels. The friendships made will not be forgotten and very missed. People travelled from all over England to East Whipley Farm in Shamley Green for the regular clinics, training days and demonstrations. I’ve been lucky to live so nearby and able to drop in regularly, even if only for a few hours. The last three events at the TTT were very well attended by the members. 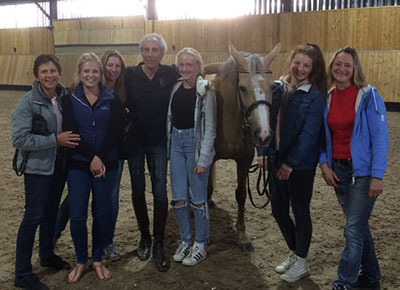 Arthur Kottas gave his last clinic in November, but, will be coming back to the Contessa Riding Centre in Hertfordshire next year. The Trainers day, also in November had a super turnout and, as always, Alex Cookson and Andrew Murphy presented an interesting day of theory and demonstration on transitions. The last TTT clinic was with Miguel Ralao in early December. It was so sad as the last horse left the school to know that it was the end of the TTT. We are all hoping that the work of the trust will continue in other areas and that Alex and Andrew will hold some clinics next year. These months have flown by and I still haven't completed all my case studies! Always so much to do and never enough time. The mild winter has been good for training with very few teaching days cancelled due to weather. Ligero has been ticking over and feeling very well in himself, we've just got back from a few days training with Andrew Murphy at the TTT. It's always so nice to get some eyes on the ground and work through exercises to help Ligero continue to remain supple and healthy. I'm enjoying the clinics that I teach and I am looking forward to doing one for Bookham Riding Club in April. Please contact me if you would like to organise one for your yard or club. From March onwards the TTT has a busy programme of training days where spectators are always welcome. 10 - 13 March - Charles de Kunffy will be teaching daily. 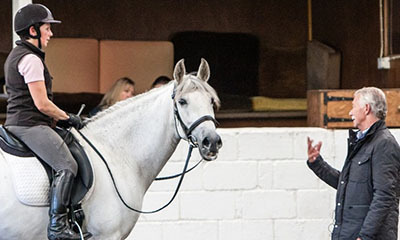 Sunday evening 12th March - Charles will be giving a lecture demonstration on 'The correct use of the leg, seat and rein - The riders tool kit..
14th March - Trainers Day with Charles. Also worth a look, check out www.dovecotestables.co.uk for their annual programme. Charles will be doing a training day there with Andrew Murphy in March following on from his TTT clinic. A beautiful venue in Chipping Norton, Oxford. 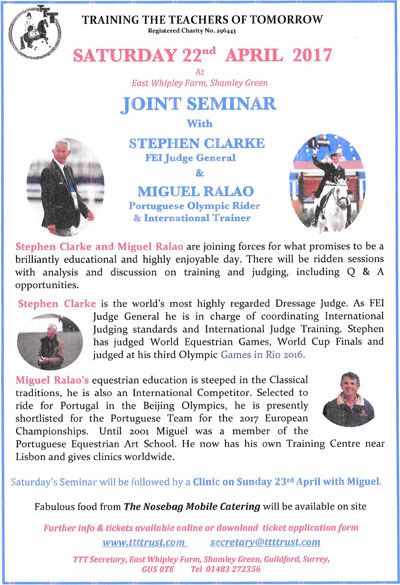 In April the TTT will be hosting a joint seminar with Stephen Clarke and Miguel Ralao again due to it being a huge success last year. October started with another outing to compete at Pachesham EC in a few more elementary tests. Ligero won one test on 69.82%, his best mark at this level. He was unsettled in the next test and was unplaced with 65.73%. In the last few months he has felt so much more confident and we are having fun. The weather has been lovely this autumn and great for riding. Every year is so different, it's hard to make plans for winter clinics with so few indoor schools available. We will organise dates and hope that we won't be affected by bad weather. Over the next few months I have to knuckle down to doing case studies for my acupressure course. I have been enjoying learning all about it, feeling and seeing the results. I just need more hours in the day! Wishing you all a very Happy Christmas and have a great New Year. The last few months have flown by. In August I took Ligero to the Iberian Performance Show at Merrist Wood and he won the Ridden PRE gelding class for the second time there. 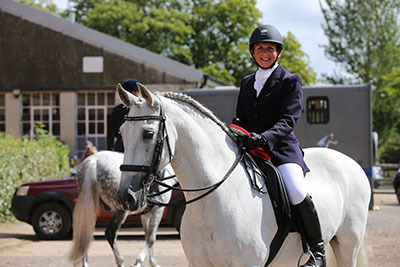 This has become an annual event for Iberian owners, now in its fourth year, and is well run by Sherene Rahmatallah and her team. 1 - 3 September I had a super 3 days at Dovecote in Oxford watching Manolo Mendez again. He really is a very special man who works with the horses so kindly and patiently. At times the audience were moved to tears, you had to be there to understand and see it for yourself. Six of my clients from Chobham came up together and stayed for two days and a few others made it for a day. They all went home truly inspired and have since been working their horses in hand as well as riding. With the youngest being only 14 years old, it's brought a smile to my face every time when they tell me that they 'Manoloed their horse this week'. This is a new term which the girls have made up, if you ever get a chance to meet and watch Manolo, you will understand. Thank you Manolo for being such an inspiration! This month I also took Ligero back out competing at Elementary. It was our first dressage competition in about 18 months, so I couldn't believe it when I heard we had won both tests! He was still a bit spooky, but generally much more focused. If he could stay more with me throughout the tests I could really improve our marks. That outing was quickly followed by a really beneficial clinic at the TTT with Alex Cookson. Having eyes on the ground and a trainer who understands where I'm at with Ligero makes all the difference. Since Ligeros accident about 2 years ago, he has found half pass difficult, so I haven't pushed him. I returned to basics and although he now feels super to ride and happy, he still feels hesitant when we venture into half pass. He never appears or feels lame, he just becomes a bit blocked and loses his throughness. That's why I've only been out at elementary. I've accepted that he may not be able to advance despite his collection developing to a higher level and his confidence improving all the time. Alex suggested exercises that had a good effect on encouraging Ligero to step through correctly into a few half pass steps. That's where those 'eyes on the ground' benefit us so much. I'm hoping that Ligero is just holding back mentally rather than physically and by continuing to take it gently and getting his confidence we will be able to move forward. I injured my right shoulder a few years ago and basically it's fine unless I move into a certain range of movement, then I am in trouble and it becomes painful. I can understand that it's not going to be any different for a horse, just hope Ligero doesn't feel like me and will be able to advance. At the end of May we travelled up to Liverpool to watch Manolo Mendez training horses and riders of all levels. What should have been about a 4hr journey took us 8! It was worth it. We had a super few days, the weather was great and we had a bit of a holiday too. It is such a pleasure to watch Manolo with the horses, he has a kind, understanding manner and really cares about the horses well being at all times. Manolo will be back in England 1st - 3rd September at Dovecote in Oxford. Highly recommend attending if you have the time to go. In June I was lucky and managed to get a riding place on Stephen Clarke's clinic at the TTT. We worked mainly on keeping Ligero focused and really through to the contact. Ligero has always been very difficult to train as he is very sensitive and can become nervous in new environments. This has improved immensely over the years and has been a disadvantage in competition. I have found his slow progress disappointing, but, I respect that not every horse can be what we want it to be. Most people would probably sell and get another one, that's not for me. I value the very special partnership I have with Ligero and I feel we have fun together, even if he is not as advanced as I would like. He feels so comfortable in his body and riding a horse that feels happy is just the best! Ligero then had a holiday while I attended an acupressure course later in June. I was inspired to learn about acupressure last summer in Munich when I met Manolo and the late Dr Kerry Ridgway. Over the two day seminar last year, I watched several horses each day being assessed and treated with acupuncture. The results were amazing and Dr Ridgway emphasised that applying acupressure on the points was as effective. The course I attended was through Tallgrass Acupressure Institute. People had come from all over the world as well as far and wide in the UK to attend. I was lucky that the venue was fairly local to me. There is so much to learn and understand, I just have to keep doing it, studying and learning whenever I can - I'm trying. I've done some interesting case studies, which I have to do and submit as part of my exams, thanks to many of my clients who have let me use their horses. I've still got quite a few to do, it's really interesting and I'm looking forward to completing my course work and exams. Looking ahead - July is usually a quiet month for me and holiday time. August will pick up again with more clinic dates booked. The Iberian Show at Merrist Wood is on for 3 days 19th - 21st August. I hope to take Ligero on one day. Looking forward to Manolo at Dovecote early September and then clinics start at the TTT with Charles de Kunffy on the 9th. Spectators are welcome at both venues and much can be learnt from watching. The year started with the very sad news of the death of Dr Kerry Ridgway on the 3rd January. A very special man who will be missed by people all over the world. I feel so privileged to have met him last year and watched him work for two days. He inspired me to learn about acupressure and I am now on a course. I had my first outing with Ligero in February. A two day training clinic with Alex Cookson at the TTT. Ligero felt happy to be out again, we hadn't been out since last April! We had a constructive two days and the weather even stayed dry for us. In March we went back to the TTT for a clinic with Charles de Kunffy. Ligero was very unsettled and difficult to train. We found some soreness in his right quarter and came home very disappointed. After a week off and a visit from Osteopath Nigel Hole and Equine Body Worker Diane Daynes he was back on form. There have been some super training days and seminars held at Dovecote in Oxford and, more locally, at the TTT in March and April. These two venues have a full calendar of events worth attending to further your knowledge, keep an eye on their websites for details. As I write this its mid May and at last the fields have dried out and it's warm and sunny. I've even been able to ride in the fields, which Ligero seems to enjoy. The soft turf gives him a cadence that feels airborne! At the end of the month I'm away to Liverpool to watch Manolo Mendez training. A long way to go, but, he is amazing. If I remember correctly, Dr Ridgway referred to him as the Magic Man. Unfortunately it's too far to take Ligero, we are hoping that we can get Manolo to come further south on his next visit. He is based in Australia, so he doesn't come very often. I have a new clinic venue in Chobham. Please see the clinic page for details. I am always happy to travel further to do clinics, please do contact me if you would like to organise one. It has been a quiet few months and Ligero has continued to make good progress, I'm looking forward to getting him out to some clinics in the new year. The TTT has an exciting programme for next year so check out their website and get some dates in your diary. Ligero has made a full recovery and feels great. I am not planning to go anywhere until the new year as Ligero needs time to return to work gradually and rebuild his fitness. 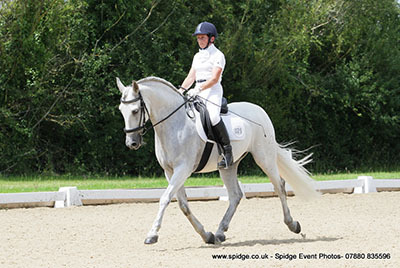 There are several clinic dates coming up at the TTT and at Dovecote Stables which will be interesting to watch. Check out their websites for what's on. After the unpleasant experience last month, it was enlightening to attend a brilliant 2 day symposium held in Munich with Dr Kerry Ridgway, Manolo Mendez and Col Christian Carde. The symposium was 'Optimizing Horses Straightness, Balance & Performance Through Fascia Retraining & Postural Rehabilitation'. 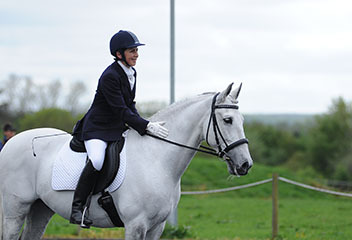 It was organised by Caroline Larrouilh, principal of Proud Horse Connections. 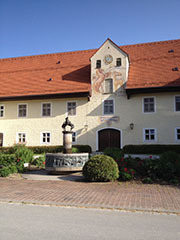 It was held at Schwaiganger, Bavaria's State Stud Farm. 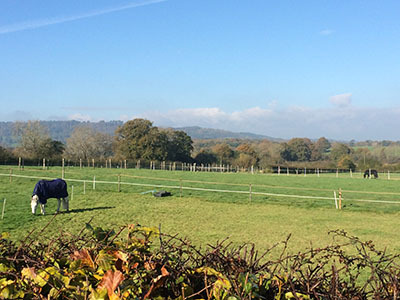 It is an active Stud Farm and hosts many events throughout the year. Ligero is now back home and still under review. June started with a trip to Switzerland to visit Anja, who had been a client of mine for a few years in England before moving there. I had a lovely time and did some riding and teaching in the morning at this beautiful yard, followed by sight seeing in the afternoon. On my return, I moved Ligero into Livery in Winterfold Forest to get a chance to hack him more. He needed to have some time doing straight lines and hill work while recovering from his injury. Also during June, I witnessed and experienced, first hand, the terrible training methods that many horses are being subjected to by people who seem to be totally unaware of how cruel they are being to their horses. They ride and compete at Grand Prix, so in their mind, they are right. I was away with a friend for a few days and we visited a yard that left us both feeling quite disgusted. While people are doing well in competition, it is hard to get them to change. For the horses sake things must change. Fortunately there are people out there, who are respected knowledgeable horsemen, who are trying to educate and prove it is wrong. Horses trained kindly are a pleasure to ride, happy to work with us and still train to Grand Prix! In April I was fortunate to get a chance to train with Olympic Rider and Trainer Miguel Ralao from Portugal at the TTT. As Ligero was still not fully back into work, I had to keep his training very basic and he was also a little more nervous than usual. Miguel was a very sympathetic trainer and we spent our two sessions just getting Ligero back on track. His accident has affected him a lot and I am concerned that he is still uncomfortable. It would have been great to have been able to benefit more from Miguel's training, but, Ligero needs time and his well being comes first. Ligero was feeling his best ever and I was looking forward to the Spring and getting out to clinics and some competitions. In February Ligero had a freak fall when he spooked on the lunge. It was a horrid fall and I was very surprised that he did not appear lame after it. I knew he would definitely not be unhurt from such a fall. He was assessed by the Physio and an Osteopath and nothing too bad was found - I was surprised. A little time off and gentle in-hand exercise for a few weeks with a careful return to work is the plan. 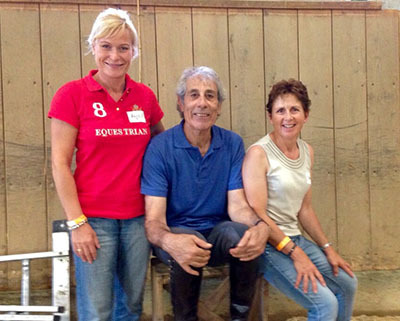 In March Charles de Kunffy was at the TTT to do his annual clinic and demonstration. We are so lucky to get to meet and learn from Charles so regularly. He extended his UK visit this month to also teach in Oxford, so I went to another super training day at Dovecote Stables in Oxford with some clients. Andrew Murphy, Charles de Kunffy and Gerd Heuschmann came together for the first time to give an inspiring day of lectures, discussion and demonstrations on Classical Training. As always, these informative days show why it is so important to understand the biomechanics of horse and rider and to adhere to classical principles. Since last September I have been very busy helping family and doing executors duties. Ligero has been ticking over in his work and we have been chilling out at home. Work has been steady and rewarding, with horses and riders making good progress over the last few months. As mentioned in my last news, I had a few more clinics and a competition before the winter set in. Our last competition was a bit of a disaster - Ligero was very unsettled and not like his usual happy self. Disappointing, but we can all have a bad day and that was one of them. A few days later we were on a training clinic at the TTT and Ligero was super. In October we were very lucky to get places on a 2 day clinic with Stephen Clarke again at the TTT. Stephen is always so helpful and encouraging. He treats every horse and rider as a valued partnership, and gets great results with his training. Ligero has continued to develop more collection in his canter work and feel very happy in himself. 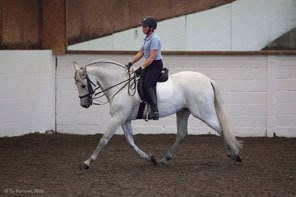 There are many training days and clinics coming up at the TTT in Shamley Green, Surrey ( www.ttttrust.com ) and at The Dovecote Stables in Chipping Norton, Oxford ( www.equinethos.co.uk ). Please do look up their websites for what's on. 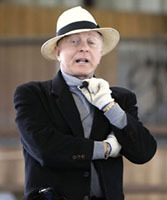 They both offer spectators an opportunity to watch lessons and lectures with brilliant trainers from Europe and America. There is so much to learn and these training days are an inspiring way to learn from trainers with high standards in correct Classical Horsemanship. 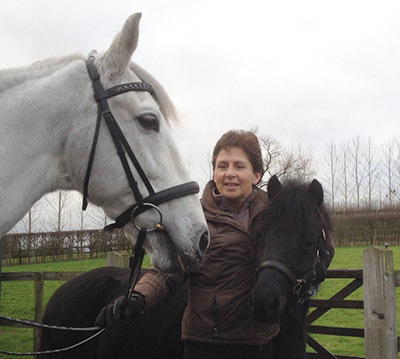 I have some new clinic venues to teach at in 2015 and I'm looking forward to meeting new clients and their horses. Please check out the 'Clinic Page' for details. So, as we look forward to the Spring and having fun with our horses, here is a quote from one of my clients 'it's not all about competition, it's about the journey'. It has been a lovely summer and I've kept very busy teaching, training and competing. Ligero has been much more confident and he has been averaging 65% in Elementary tests. There always seems to be something that will spook him in the arena, but, generally he has been much better. With many marks of 7 and 8, it's frustrating when he loses attention and marks. He could do so well if he would just stay with me all the time. Having said that, he has been improving every time we have been out. We went to the Iberian Performance show at Merrist Wood on 24th August. Ligero won his showing class for Ridden Pre Gelding. He did feel great that day and seems to enjoy being in the arena with other horses. We did qualify for the Area Festivals at Elementary and went to Pachesham on the 25th August to compete. I think we were both a bit tired from the day before and it was a horrid wet windy day. We came 10th with 65.6%. I know we could have done much better but I went wrong in my test and it disturbed Ligero. We had a super clinic with Charles de Kunffy in early September and also participated in the evening Lecture Demonstration. Charles had me introducing some piaffe work in our training sessions and Ligero felt like he had found a new gear on this clinic. He feels so much stronger and confident in his work. I was very pleased with him in the demonstration as he didn't spook at the gallery full of people ! In September we will be at the TTT for a few days of training and have one more competition. There is a programme of training at the TTT from now through to December. Spectators are very welcome. Check out their website for details TTT. The wet start to the year continued and the first training clinic that we were to attend was cancelled the day before due to the indoor school flooding! February went very quickly and the weather was not encouraging for making too many plans, especially when you have a grey horse who may need a bath. Having said that, Ligero does stay very clean most of the time. In March I took Ligero to the TTT to ride on the Charles de Kunffy Clinic and we took part in Charles Trainers Day Demonstration. These, as always, were very helpful sessions and Charles gave us much to work on. Spectators are welcome at all the Clinics at the TTT and there is a busy annual programme. There is a Training Day with lectures and demonstrations on 2nd June - check out the website for details TTT. As the weather began to improve I felt it was time to get out and compete in late April. All ready to go and Ligero caught his shoe and ended up a bit foot sore for a few days. This happened the day before and I had to withdraw. Very disappointing, but that's life with horses! Schooling Falik. She is a Norwegian Fjord who is recovering from an injury. It is the first time that I have worked with this breed. They are very versatile gentle horses and Falik is part of a special team used for equine assisted therapy for people with special needs. looks really happy in his work". That means more to me than winning a competition any day. It is such a privilege to get to train with these international trainers and much can be learnt from watching the lessons too. We then had a last minute place on another Clinic the following week with Alex Cookson at the TTT. 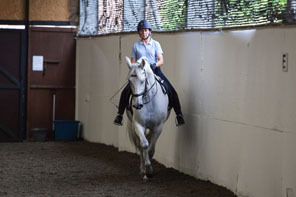 We continued working on from our clinic with Stephen, which was to improve the quality of the canter. 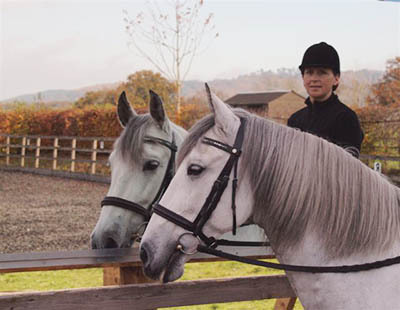 Alex is always very constructive and has an understanding approach to training sensitive horses. We managed to get to our first competition of the year and did 2 Elementary tests, coming 3rd and 6th on just over 65% in them both. Ligero wasn't 100% with me and lost marks for some tension and spooking. Overall, I was very pleased with our first outing since last summer and we just need to get back into it. May ends with a day training with Gerd Heuschmann at Dovecote on the 31st. 6th June 6pm - 9pm Masterson Method Massage Lecture. An Introduction to the Masterson Method a unique, interactive method of equine massage. 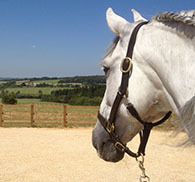 up of notable trainers and equestrian experts will be joining us at The Dovecote Stables, Oxford in the coming weeks. 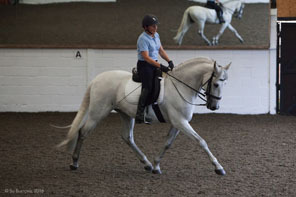 During the next 6 weeks we are so pleased to confirm that Dr Gerd Heuschmann will be returning to The Dovecote and will be hosting a two day training clinic and also a lecture on Sat 31st May "How understanding biomechanics enhances Sport Horse Performance"
Finally on the 5,6,7th July Charles De Kunffy will be offering training for horse and rider and also a daily lecture from 9am - 12pm. Copyright © *2014* *Equinethos Ltd*, All rights reserved. I've had a quiet autumn and winter with Ligero. The stormy wet weather has made training difficult and he has been ticking over in light work for the last few months. I don't have any outings planned until the spring. Much of my work recently has been remedial referrals. It is a very rewarding part of my work and I really enjoy helping the horses and owners get back on track. The clinics at Bridge House will start up again in March ( see the clinic page for dates ). I would like to do more clinics and I am happy to travel to other areas to do them. If you have any ideas for future clinics, please let me know. I wish you all a very Happy New Year and look forward to helping you with your horses in 2014. At the beginning of August Ligero began to feel very tense when being ridden and I was concerned that he was in trouble. He was normal in his behaviour in all aspects of handling and looked very sound on the lunge. His saddle appeared fine too, but, it had fallen from a low saddle rack that had not been secured well enough. I asked my saddler to check it, and although it appeared to be perfectly fine, she took it away to have it checked inside. To my horror, but also relief as it meant Ligero was sound, they found the tree to be damaged. Fortunately, I was able to use another saddle from a friend that fitted Ligero well and he has been fine. This is a good example of why we must always listen to our horses and work out what is wrong. We attended the Iberian Performance Show at Merrist Wood held over the August bank holiday weekend. I withdrew from the dressage as Ligero had not been in full work due to the saddle problem, but, felt he was up to doing one show class. We did the Ridden PRE Gelding Showing Class and he was placed second. It was a well organised show with a very good turnout. 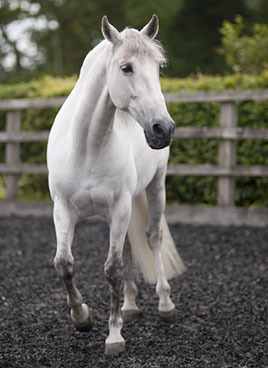 PRE and Lusitano horses came from all over the country. I think it will become a popular annual show for the Iberians. In September I enjoyed a few more training days with Gerd Heuschmann and Charles de Kunffy and decided to wait for my saddle to be repaired before planning any further outings with Ligero. In the last few months I have met new clients that have had very bad saddle problems. There is now such a huge market and mass production of saddles that perhaps not so much attention to detail is being made. As with anything we buy, it is unfortunate if we get a faulty item, and no one has intentionally sold us something that we will need to return. 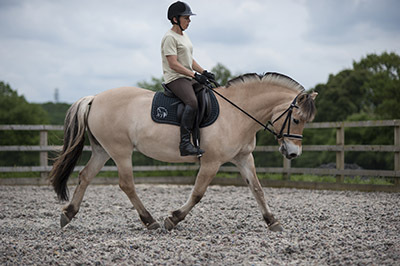 The problem is, saddle faults are not always very noticeable. 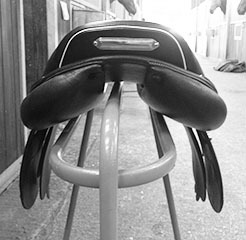 Saddle fitting can be tricky too, especially if the rider is not very experienced. I always say to people, just because a saddle appears to fit, doesn't mean that your horse will find it comfortable - if you try on 4 pairs of shoes, all your size and they all fit, there may only be one pair that you feel really comfortable in. As the owner and rider, we have to feel if it is really the right one for our balance and the horses comfort. 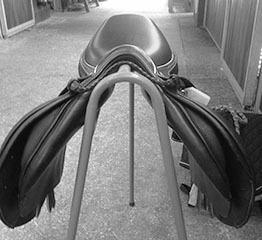 A less experienced rider will find this difficult and the saddler has to do the best they can at that time. One client I met recently was having trouble with her balance and was concerned that her legs kept going forward. Her horse was also uncomfortable on the left rein and this had been investigated by the vet, who gave the horse the all clear. The saddle had been checked on the advice of the vet and everything appeared fine, so could it be the rider? Fair enough comment, it often is, and with a little adjustment to position and balance, a horse will improve dramatically. I rode the horse and my first impression was that the saddle made me feel very heavy into the base of the pommel, and then in trot the saddle was encouraging my legs forward. The horse became tense on the left rein and easier to ride to the right. We found a different saddle to try and both the horse and rider stopped struggling. They have since been trainable together, the rider is more comfortable in herself and the horse is working through on the left rein. 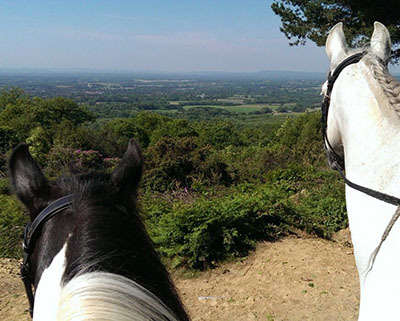 Below are two photographs of a saddle that was being used on a horse with a similar problem. The horse who had been wearing this saddle has now got some muscle wastage on one side where it had been compensating in its work. 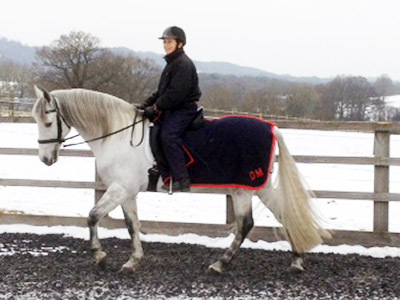 It has now been wearing a different saddle and is happy in training with the muscles working evenly again. When I go to a new client I will assess everything I see to the best of my ability. This is because I want both the horse and rider to enjoy their training and be able to progress. It is necessary to cast an eye over the whole picture, hoof balance and bridle fitting are also issues to assess. Much time, money and heartache can be avoided if care is taken in all these areas along with good stable management. You can get so much more out of your lessons and time with your horse if you give this some thought. In June I took Ligero to another affiliated competition and he felt much more confident. He still spooked in his tests, but, was generally more with me and gained 64.07%. 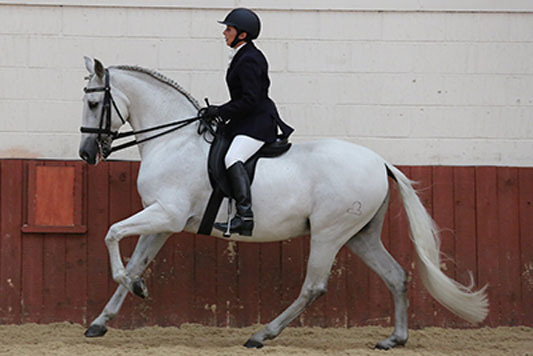 At the Iberian Festival at Pachesham he won the ridden PRE gelding class and gained 66.55% in his first elementary test. 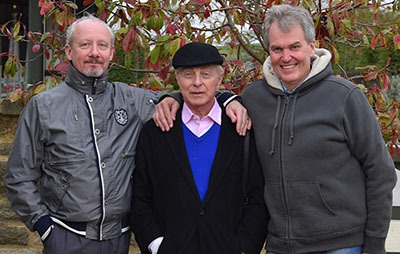 We then had a short break from outings until our family trip to the Cotswolds for the Gerd Heuschmann and Charles de kunffy Seminar. It was like a holiday. The weather was warm and sunny everyday and my husband George, dog, Ligero and myself had a great time. We drove up on the Friday morning to avoid the Friday afternoon traffic and arrived at lunch time. The venue was stunning, as you can see from the photos, beautiful views all around. Photos were not allowed to be taken during the demonstrations and lectures, so there are no photos of us in action in the indoor school. Ligero was very comfortable in his luxury stable, while we camped for 3 nights in the horsebox. The weekend was very inspiring, Charles and Gerd worked well together as they discussed and lectured on Classical Training. Everything was explained very clearly and with much emphasis on the well being of the horse. Ligero and I were one of several partnerships that took part in the demonstrations. A variety of horses and riders were used. 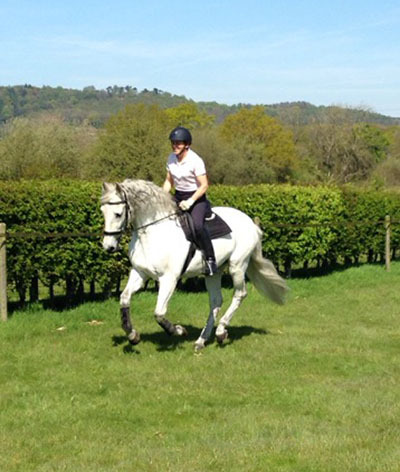 Novice and experienced riders, TBs, Partbreds, Warmbloods, Iberians, Dressage, Eventer and Remedial horses. This enabled Charles and Gerd to discuss and show how Classical training relates to all, and produced supple horses working confidently into a soft contact. I think everyone enjoyed it, made new friends and went home inspired. It was a very long wet winter, and like many people with horses and no indoor school, I just continued training when the weather allowed. I took Ligero training to the TTT in February and March, it was great to get out and do some training indoors in the cold weather. 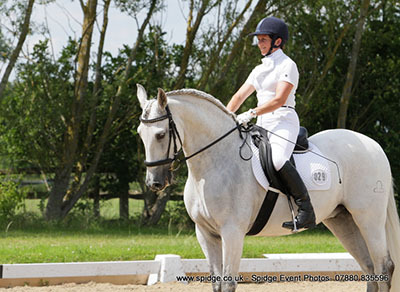 In April we went out to do our first affiliated dressage competition. Ligero felt really good in the working in, so, I was very disappointed when he spent the whole test spooking at the markers! Our second outing was better and he came home with 3 points, still losing marks for his spooking, but staying with me more. We had another training clinic in May and two more affiliated tests. Ligero was much more settled this month and gained another four points. It is very frustrating at times with Ligero as he is so capable of doing a good test. He has always been a very sharp, sensitive horse and I have to be extremely patient with him. I hope we will do better together in competition as he gains more experience in working in new surroundings. June will be busy with a few more affiliated outings and the Iberian Festival at Pachesham EC. The Iberian Festival is being sponsored by Alex Gache, Lomond Classical Training Centre. I like to take Ligero to this as Alex rescued Ligero from a field about 4 years ago and is responsible for our partnership! Coming up in July - This will be a super presentation and it is a lovely venue. Charles will be staying on to do two more days of lectures and lessons on the 22nd and 23rd July. Places are limited so please apply early if you want to go. Contact Emily Baker at www.equinethos.com for more details. November seemed to fly by and Ligero made a good recovery in time for our last clinic of this year. It was with Stephen Clarke in early December and it was great to get out after the 6 weeks of fittening at home. Ligero, as always, felt happy and energised by our two days away. We had two super lessons from Stephen and hopefully the winter won't make it difficult to continue our training. This has been an inspiring year, and I hope we will now begin to see more thoughtful training and management of dressage horses because of Carl Hester's success. At this years BD convention Carl showed how all the horses had to work through and confidently forward into the contact. He talked about his yard management and the importance of hacking and turning out the horses to keep them healthier, both mentally and physically. 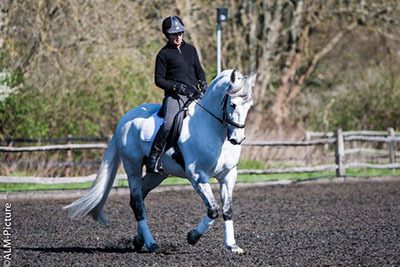 As people like to follow successful riders, this is good news for the dressage horse. Wishing you all a very Happy Christmas and a great New Year. The months seem to have flown by. The Olympics were great fun and, like many people, I found myself watching all kinds of sport and not getting much done ! We were at the Olympics on the last day of the team Dressage and it was a day to always remember. 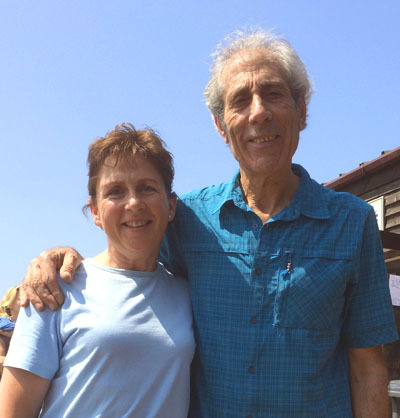 At the end of August I spent two days training with Gerd Heuschmann at the Unicorn Trust. This has become an annual event and thanks must go to Emily Baker for organising his visits to England. Emily has extra dates planned for next year and I will let you know when they are confirmed. September started well. Stephen Clarke did an evening presentation at the TTT. This was a great success and it was fun to hear what went on behind the scenes at the Olympics. The following day I had a lesson with Stephen and Ligero felt his best ever ! Ligero moved up a level in his work, and a week later we had a demanding Clinic with Charles de Kunffy. Charles saw the change in Ligero and worked us quite hard to give me 'homework' to progress on with. During this clinic I was awarded a generous Training Bursary. I was very flattered and delighted to receive it. I travelled up to watch the National Championships on the 16th and that afternoon Ligero slipped badly in the field. He injured himself and was off ridden work for a month. He has had to have regular physio treatments and remedial lunging work to recover. He started ridden exercise on the 16th October and will come back into work slowly over the next 4 - 6 weeks. I had planned on taking him to his first affiliated Dressage competition in October, but it will now be in late November, subject to the weather. I am looking forward to training with Stephen in December, when Ligero should be back in full work. Despite the disappointing summer weather I have been having fun with Ligero and, as always, enjoying my work. We attended three training clinics and competed at the Iberian Show at Pachesham Equestrian Centre. Ligero is becoming much more secure in his 'throughness' and this is helping to reduce his spooking. He feels great in his body and very happy. I was very proud of him at the Show and he seems to love working around other horses. He won the Novice Dressage test on 68.96% and the showing class for ridden PRE geldings and mares. I have just affiliated him with BD, but may not be able to get out competing until late August. The next month or two will be busy and we need a new horsebox ! I had a disappointing start to March with Ligero having a virus four days before a training clinic with Charles de Kunffy. He had to have the week off. I still attended the clinic as much can be gained from watching the other lessons, and it's always nice to catch up with other trainers and friends. The following week I travelled to Switzerland to meet up with a client and very good friend, who had just moved there from England. We then travelled to southern Germany, to visit Anja Berans yard - Gut Rosenhof. 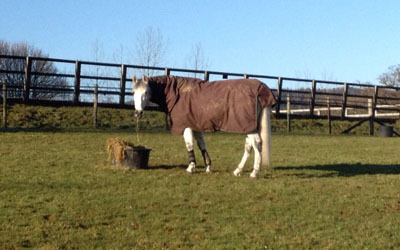 My clients horse was staying there for a few months while a suitable yard was found in Switzerland. We had a lovely three days watching the training and it was a very interesting and beautiful place to visit. The atmosphere there was so relaxed and peaceful. We heard no raised voices, saw no one rushing, all the horses and other animals were very content. It was a calming environment for anyone there. I learnt much from the experience. occur if 'straightness' is not understood. He has a new book out which will be available in english in July. Not so busy in April. Ligero is feeling great and fully recovered from his virus. 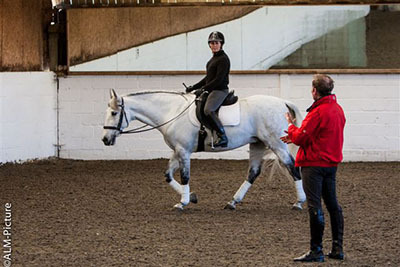 We attended a two day training clinic at the TTT with Herwig Radnetter from the Spanish Riding School of Vienna. Herwig saw Ligero a year ago and was pleased with his progress. He remembered how nervous Ligero was when he first saw him and it was great to be able to show a much more confident Ligero, secure in his outline, looking stronger in his body and more trainable. We had a super two days and were lucky with the weather, which enabled us to also enjoy some beautiful hacking after the lessons. Winter training had been going well and I was looking forward to my first outing of the year with Ligero at the beginning of February. The snow came two days before we were due to attend a training clinic at the TTT and it had to be cancelled. Fortunately I managed to make a track in my school that enabled me to keep Ligero lightly exercised until the snow cleared. Alex Swainson and I held another two Dismounted Workshops in Shalford and these were well attended. It was the first winter that we have held the workshops in a hall and it has worked very well. 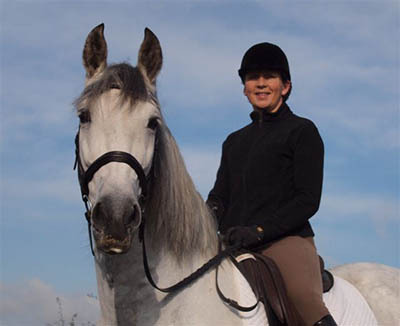 In the warmer weather we will do some more outdoor workshops and include a ridden demonstration. March will be a busy month with several training days to attend and clients doing more with their horses. Check out the TTT website for what's on. Spectators welcome. My new saddle arrived at the end of October and was worth the wait. Ligero feels so comfortable and is really working through his body. 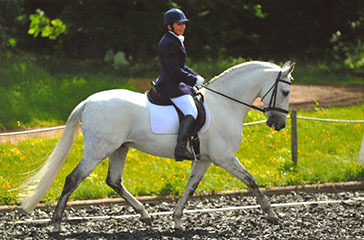 I am looking forward to getting out in the new year to the training clinics and some competitions. I am very grateful to Kay Humphries for making such lovely saddles and taking the time to ensure that both the horse and rider are really comfortable together. I am delighted with mine. Alex Swainson and I held an evening Workshop in November which went very well. We will be doing two more in January and February 2012 in the Shalford Village Hall. Please contact me if you are interested. Emails will be sent out to those of you who have been before. The workshops are fun and a nice way to meet other riders and make new friends. I had a lovely surprize for Christmas from a group of clients who presented me with a wireless communication system. I have wanted one for years and it is a very generous and perfect gift. I have been using it for work, it makes teaching outside so much easier and the clients are enjoying it too. I am very grateful and will be using it most of the time when I am teaching and helping in the warm up at competitions. I would like to wish you all a lovely Christmas and a very happy and fun new year. 31st August - 3rd September I travelled to Stow on the Wold for four days of training with Gerd Heuschmann at the Unicorn Trust. It was good fun as well as educational. Several clients came along too and we stayed at a local B & B. As always, Gerd captivated his audience with his 4hr presentation on the Wednesday evening, and then the following 3 days were horse assessments, training and demonstrations. 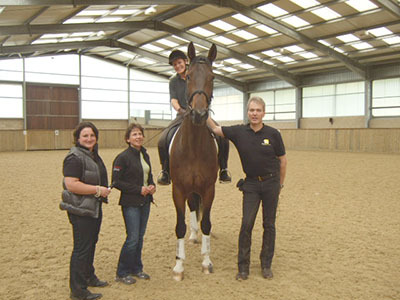 Thanks to Emily Baker - www.equinethos.com for organising another super 4 days of training with Gerd. We are all looking forward to the follow up next year. Next years dates have already been arranged, 29th August - 1st September 2012. Venue to be confirmed in Oxfordshire. Ligero has been working very well and due to his development, his saddle has had to be changed. This has caused a frustrating break in his ridden training and we have missed 3 clinics while we wait for his new one to arrive. He has been worked in-hand and on the lunge to maintain his fitness and continue his training until the saddle comes, hopefully by the end of October ! Ligero and I have been out training to three clinics in the last two months and I am very pleased with his progress. He is such a pleasure to work with and he feels very comfortable and happy to ride. I took him to the Iberian Festival at Pachesham EC on 19th June and he won both his classes. I didn't expect that on our first time out so it was a very happy day ! In June we had two Dismounted Workshops and another one in July. We are featured in the June and July issues of Horse and Rider Magazine. The articles are on how Tai Chi principles can help your riding. 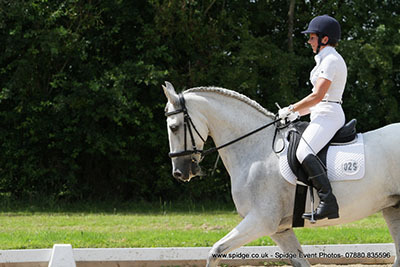 July and August - Work is busy, it's holiday time, Hickstead International is on and Gerd is back 31st August. Just going to enjoy the summer and try and fit everything in. Despite the difficult winter I managed to keep Ligero in training and he has gained in confidence. We attended clinics at the TTT with Alex Cookson, Andrew Murphy and Stephen Clarke. These have been a valuable part of his education and a good way of testing his confidence and level of work away from home. At each clinic he became more focused and less concerned about things around him, venturing closer to the spectator gallery! We are due to attend two more clinics in May. I also managed to have another training day with Gerd Heuschmann in Oxford, and one of my clients had a great time participating on his 3 day clinic. It was great to have his input on how we have been working her horse and he gave us encouragement to keep going with our remedial work. We did our last workshop of the year at Moorcroft on 27th November 2010. Despite the cold we all had a good day, the sun did shine, so although we had use of the lovely new indoor school, we did the workshop outside. This enabled Horse and Rider Magazine to take some photographs and we are delighted that they came along to see what we do. Thank you to all those that participated and braved the cold, and to Mary who made us all feel very welcome and kept us supplied with tea & coffee throughout. All the proceeds from the day went to the Centre. We will be returning to Moorcroft in 2011 to do some more workshops. I first heard Gerd Heuschmann lecture in 2004 at The Young Horse Seminar held at Hartpury College. I have attended his lectures annually since then and can highly recommend them. This year I was fortunate to get to his Presentation and Clinic at the Unicorn Trust, Stow on the Wold for two days in September with one of my clients, and then again in October at the TTT. Gerd is a Veterinary Surgeon who has specialised in equine orthopaedics, been head of the breeding department at the German Equestrian Federation and is a trained Bereiter. 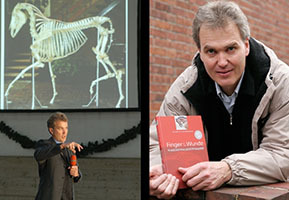 He has his own Veterinary Clinic in Warendorf and lectures all over the world. His Presentation ' The horses anatomy determines its way of training ' is a very inspiring, thought provoking lecture on the bio-mechanics of the horse. Using computer projections he gives a clear explanation of the advantages and disadvantages of different training philosophies. 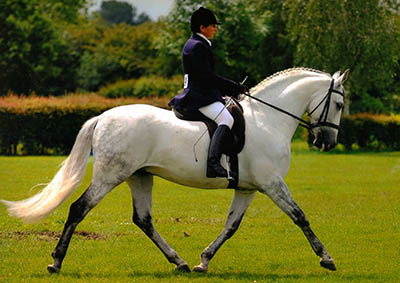 The background of the classical riding principals is based on this bio-mechanical knowledge. He also works with riders and their horses to clearly show the effect of good training and the importance of the rider having a good seat. Every year he brings new research to his presentations and holds the attention of his audience throughout. We never stop learning and I am grateful to Gerd for speaking out for the good of the horse, and giving so much of his time to educate us. I can highly recommend his book - Tug of War - Classical versus "modern" Dressage. Why classical training works and how incorrect riding negatively affects horses' health. Also his DVD - If horses could speak - this has a great 3-D animation which makes the principles discussed in his book very clear. Gerd will be back at the TTT next year. I would like to say a ' Big Thank You ' to Sue Dennis, Lynne Leeder and Maureen Moss for their sponsorship this year for my new horse - Ligero, and to Anne Simmonds for her contribution towards new training mirrors for the school. Thank you all. LIGERO - My new horse is a purebred Andalusian, grey, 9 year old gelding. He has settled in very well and is a joy to train. He is a very sensitive horse who was so spooky about everything when I first met him, that I wondered if I would ever get him to concentrate! 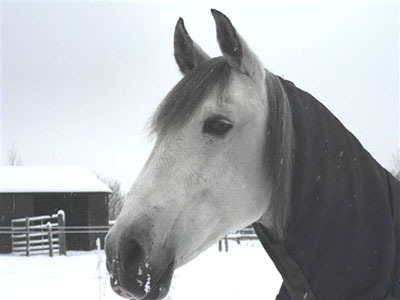 He came to England in '08 and had to be rescued from a field where he had suffered neglect later in the year. It took most of '09 to get weight back on him and be able to begin to train him. I did some work with him at this time for Alex Gache. I enjoyed working with him so much that I bought him in July. Thanks to Alex for rescuing him and matching us up ! He is becoming much more confident and getting stronger in his body after such trauma. I am hoping to compete him next year, but, he needs time and patience, so we will have to wait and see.